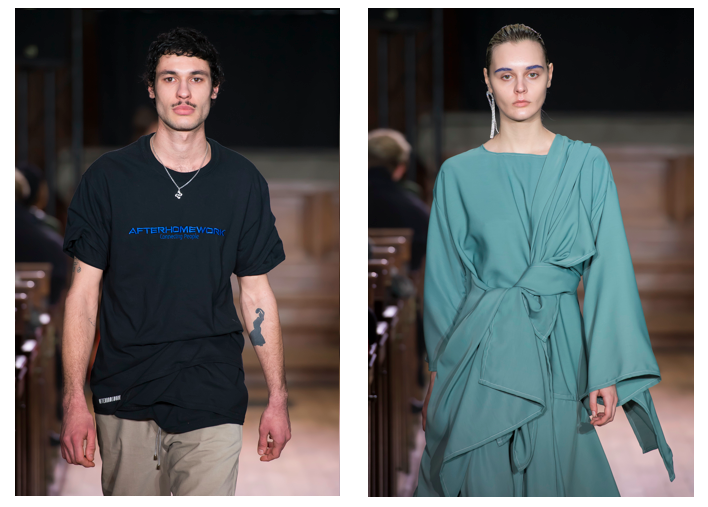 Having started his fashion career by making T-shirts for his friends after school, Pierre Kaczmarek has now conquered the runways of Paris Fashion Week with his creations. 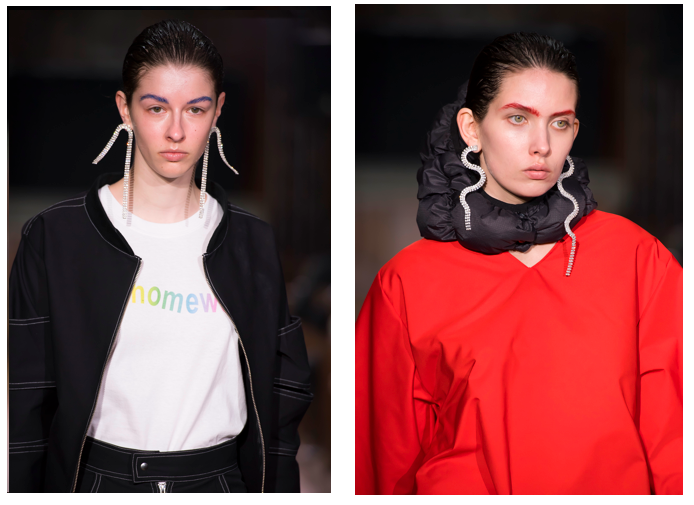 Together with his girlfriend, the stylist Elena Mottola, he started AFTERHOMEWORK(PARIS), a label that represents their passion for creation and carefree urge for innovation. 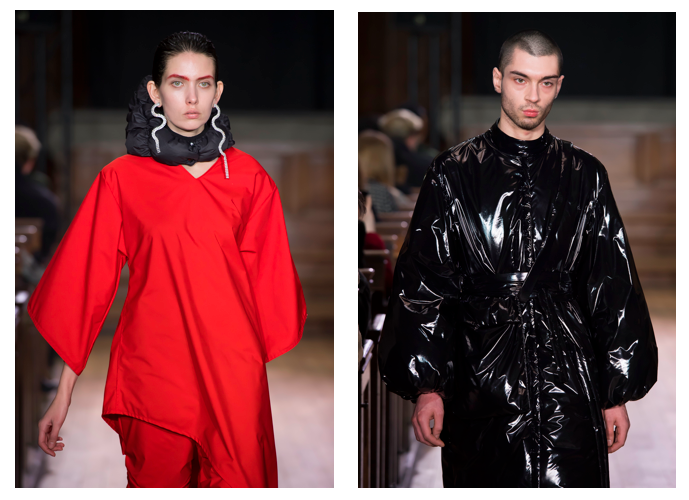 Their latest collection for Autumn / Winter 2018 is a mixture of bold silhouettes with deconstructed workwear elements in either natural colours or bright red. 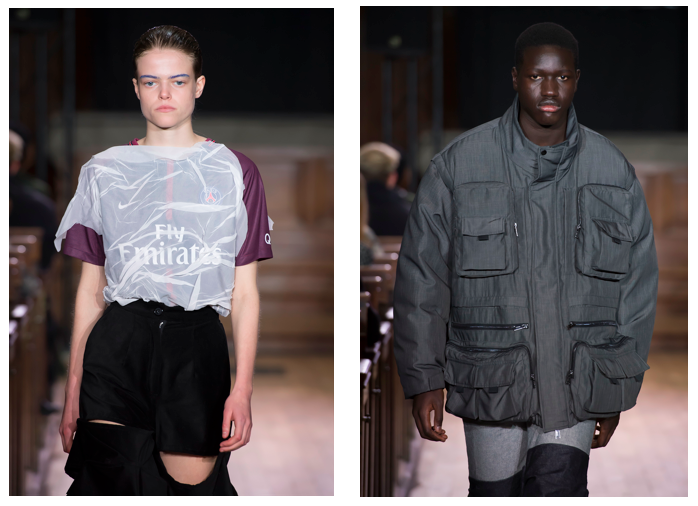 But especially striking are the cut-up soccer shirts of Paris Saint-Germain, the club which Pierre has a special connection to. In true fashion week manner, we asked Pierre all about his inspirations for the designs – one moodboard snippet at the time. This AW18 collection is a continuation of the one from last summer. We were inspired by our surroundings, our lives and our observations. 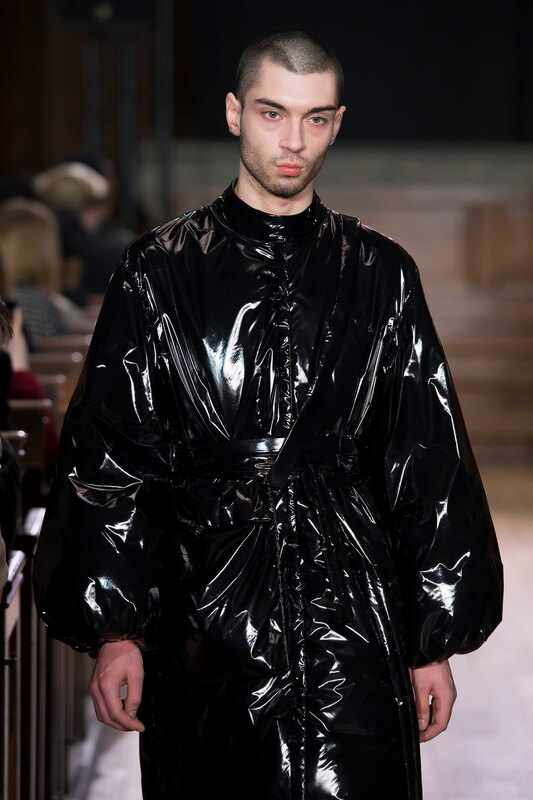 The looks are more futuristic and hard, we really try to draw inspiration from our present experiences and imagining a young and urban silhouette of a near future. The main topics of this collection are money, work and how to prevail in the society in which we live. The taboos and concerns which are often hidden behind these subjects inspired us for this collection. This is why the silouhettes are aggressive and quite opulent and why there are a lot of workwear elements. We tried to completely decompose different styles to eventually end up with some harmonious designs. I have been a very big soccer fan, especially of Paris Saint-Germain since I was very small. The club is very open-minded when it comes to fashion, so I promised myself to ask for a collaboration with them to present my vision of the jersey. It was like a inevitable step because we are really inspired by what we live by and I really live to the rhythm of the games, so this element was necessary to enter the collection. And even if Elena was not convinced at the beginning, she supports my passion and in the end, she loved to work on the jerseys as well. With this collection, we took what had worked out in the previous one and improved the technique of the cuts, so that they are still raw but mastered. In terms of colours, we really started with natural colours, from metallic and sky blue to dark green. The lighter colours were added to give a little life to the designs. The rather bold Ferrari red is inspired by the iconic colors of the automotive world that goes along with the theme of money and work in our collection. Make-Up artist Manu Kopp was the one taking care of the make-up for the show. We did several tests including more complex things and then we decided to just go for a very natural makeup on the face of our models to underline their uniqueness and just put some colour on the eyebrows. And yes, these can definitely be seen like an accessory that we added to every look.